I’m in good company – John Piper and Tim Keller have both battled cancer – and there are many other less known Christians who have faced the battle. As of today, Piper and Keller have been freed from any trace of cancer. Perhaps my greatest pastoral hero was Dr. James Montgomery Boice. When he was diagnosed with cancer he continued to minister in his church in Philadelphia as he always had – being faithful to the gospel, emphasizing God’s glory and sovereignty – and the Lord took him home within six months of his being diagnosed with cancer. He was steadfast and brave because all he had known and preached for forty years was the sovereignty and goodness of his Savior – the Lord Jesus Christ. Tomorrow, I go to the hospital for a PET scan. When I first found out recently that the lump in my neck was cancer (and not an infection – as I had hoped) – I didn’t take the news too well. After receiving the news I came home and went for a long walk – cried, prayed, got angry with God, confessed every known sin, and got extremely tired, depressed, and discouraged. A few days after the news I settled down and realized that this is where the gospel meets the road of life – when faced with our mortality. Suffering is a bracing slap in the face that drives God’s people again and again to clarify and purify the fundamental terms of acknowledgment and worship of their God. It drives us to turn our hearts to God in truer prayer. The rediscovery and application of a brutally realist God-centeredness is an urgent need in an era of much crass human-centeredness—typified recently in the ego-centered absurdity of Episcopal priest Ann Holmes Redding’s simultaneous profession of both Christian and Muslim faith (Cf. Eric Young, “Episcopal Priest Suspended over Muslim-Christian Identity,” Christian Post Reporter, July 7, 2007, http://www.christianpost.com/article/20070707/28350_Episcopal_Priest_Suspended_Over_Muslim-Christian_Identity.htm – July 9, 2007). Nor have we explored implications of the fact that whatever suffering Christians and everybody else must endure in this world, it pales next to scriptural predictions of what awaits the divinely accursed both in this age and in the age to come (Cf. Stephen Keillor, God’s Judgments: Interpreting History and the Christian Faith. Downers Grove: IVP Academic, 2007. 40. See Christopher W. Morgan and Robert A. Peterson, eds., Hell Under Fire. Grand Rapids, MI: Zondervan, 2004). This has contemporary significance in that contemplation of both current and eschatological woe is an important incentive to cultivate a seemly sense of urgency in personal pursuit of God, in ecclesial labors including evangelism, and in mission generally. But the last word of this introductory chapter belongs not to one more thesis or argument but to a story. We began speaking of a boy’s death by crocodile in Costa Rica. No one could save him [he was killed by the crocodile]. A second story, very similar, has a different ending. In the Nseleni River near subtropical Empangeni, South Africa, two third-graders released from school with pinkeye decided to slip away for a secret swim. As they were leaving the water, a hidden crocodile’s jaws closed on Msomi’s leg. He shouted frantically for help. Companions wisely and understandably fled. Except for Themba. He grabbed his friend Msomi in a tug-of-war with the determined reptile. Matters hung in the balance for a long turbulent moment. Suddenly Msomi broke free. He scampered out of the water, bleeding from his left leg and arm and from a cut across his chest. But he was saved. And Themba the noble rescuer, a third-grade kid with the heart of a grizzled warrior? Msomi, visibly shaken, lamented from his hospital bed: “I ran out of the water, but as Themba tried to get out, the crocodile caught him and he disappeared under the water. That was the last time I saw my friend alive. I’ll never forget what happened that day—he died while trying to save me” (Sibusiso Ngalwa, “Boy Dies Saving Friend from Crocodile,” April 4, 2004, http://www.io l. co.za/?click_id= 14&art_id=vn20040404110517366C649996&set_id=1 – July 10, 2007). The crocodiles of crises and calamities beset us all. Eventually we wander into the kill zone where the unwanted lurks, biding its time. Suffering is ubiquitous and finally terminal in this age. But there is a God, and he is good, and those who seek him are saved. 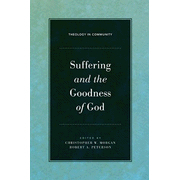 We are all Msomi, but there is a Themba (Christopher W. Morgan and Robert A. Peterson, eds., Suffering and the Goodness of God. Wheaton, IL. : Crossway Books, 2008). I praise God that Jesus is my Savior – my Themba. Although Themba’s death for his friend was an incredible act of love it was not salvific in a spiritual sense. Only Jesus’ perfect life and purposeful atoning death propitiated the wrath of God that my sin deserves. Therefore, whether this cancer takes my life or not – I’m covered by the blood of Christ’s death as payment for my sins. His perfect love casts out my fear! I’m sure I’ll have ups and downs along the way. However, I hope that whether I live or die soon, or in several years that I can live like Keller, Piper, and Boice who have paved the way for me – at peace with God because of Jesus – my Themba! My heart’s desire is that whether God chooses to take me home or spare my life mercifully and graciously that I will be able (with Christ’s help) to bring Him the glory that He deserves for already sparing my life and rescuing me from eternal separation from Him. May I be able to say with the apostle Paul, “For me to live is Christ, and to die is gain”…and “So whether we [I] eat or drink, or whatever we [I] do, may all be to the glory of God” (Philippians 1:21; 1 Corinthians 10:31). “For our sake [my sake] he made him [Jesus] to be sin who knew no sin, so that in him we might become the righteousness of God…There is therefore now no condemnation for those who are in Christ Jesus…If the Spirit of him who raised Jesus from the dead dwells in you, he who raised Christ Jesus from the dead will also give life to your mortal bodies through his Spirit who dwells in you…For I consider that the sufferings of this present time are not worth comparing with the glory that is to be revealed to us… And we know that for those who love God all things work together for good, for those who are called according to his purpose. For those whom he foreknew he also predestined to be conformed to the image of his Son, in order that he might be the firstborn among many brothers. And those whom he predestined he also called, and those whom he called he also justified, and those whom he justified he also glorified. My best friend is battling cancer as well. She is extremely brave and I see God using her to touch other people’s lives, offering hope to them. God’s light always shines brightest through our brokenness. I will most definitely keep you in my prayers. Trust God. Have faith. This is your time to shine! Thanks so much for your prayers! I agree with you; and as God brings your best friend to mind I will pray for her too! Been there, done that! Let me know if you need anything, Dave. You didn’t mention where you are going for tests, but I thank God every day for the doctors, nurses and surgeons at UCI who saved my life. Carolyn and I are praying for you and Dana. God Bless you on this journey! Thanks Man! I will definitely be talking with you soon as I find out more – Eric and Marci gave us a lot of good advice with Marci’s work and that’s who we are working with right now – the Big K – so far they have been Great! I am Andrew Jackson, a financial writer. Today I came across your site ( http://verticallivingministries.com) and enjoyed reading some of your articles. I’m sure you are an excellent writer and have a lot to say that can benefit my readers. At this time I have enough material for a life time to benefit those whom I pastor and coach – so I’m not taking any “guest writers.” If you don’t already have your own blog its really easy to do. You can be up and running within minutes! I wish you well and hope you can help many people as a financial writer.